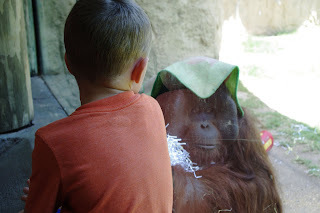 Last week the kids and I met up with friends and hit the zoo. We lasted 5 1/2 hours at the zoo...WITHOUT a single meltdown!!! We spent half of our time with friends and while I enjoyed having company, we had quite a few magical moments off on our own. 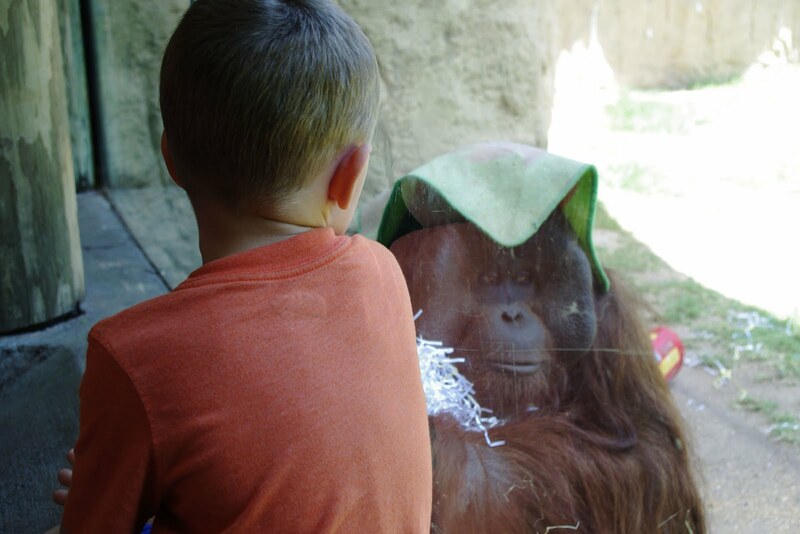 My favorite part of the zoo (aside from feeding the giraffes) was watching my kids become completely fascinated with an orangutan named Doc. We hung out with Doc for quite some time, he checked us out, we checked him out and spent over 30 minutes just admiring each other. I have never seen my children so calm and content. It truly was a magical time that I am so thankful to have caught on film. Now, the lighting was horrible, but it was SUPER sunny and the middle of the afternoon. That doesn't bother me and I still love the photo for the sense of serenity that it brought to my children and myself as well. Doc, we hope to visit you again soon. P.S. Doc has a rug on his head that he was adamant on keeping there and hugging a ball of shredded paper, which he defended against a younger orangutan to keep. He also had a blanket balled up in his lap. Oh My Crazy Busy Batman! I am a *30ish* year old wife to a wonderful man, the mother to two wonderful little boys and the caretaker of two lovable dogs. I am continually striving to make myself better and learn new things as well as try new things. I love art, creating art, actually just creating anything. I enjoy puzzles and building anything. I also love sports, both playing and watching. All images are copyrighted. Please do not re-post my images without my expressed written permission. If you do use an idea or tutorial please link back to the original post. Thanks!